Lampwork has its own special beauty in the bead world, as each bead is its own work of art. My friend Carolyn is a lampworker who has tons of smaller beads, so we thought it would be fun to design a piece of jewelry that could use a bunch of 'loosies'. These are beads without partners or sets, that have a beauty all their own, but don't always find a place in beadweaving. I have a good selection of different sizes, bought mostly because I couldn't resist their beauty, but couldn't figure out what to do with them. 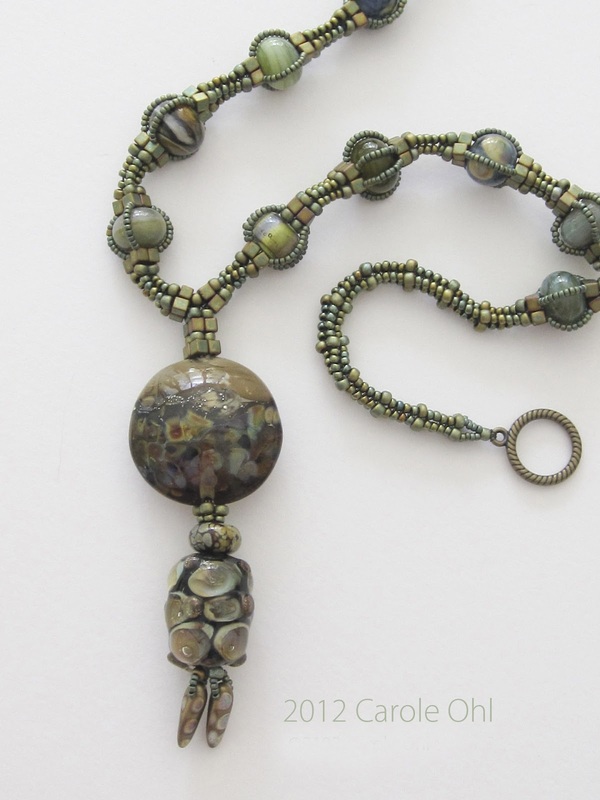 This necklace actually uses about four different lampworkers' beads. Carolyn's appear in the strands, and I wish I could remember who created the larger beads. This design is named Village Lampwork Necklace, as it took a village of artists to create it. I feel very lucky to be inspired by the artists who created these beads, and reminds me once again, that inspiration makes the world go round. And it often takes a village for things to come together. 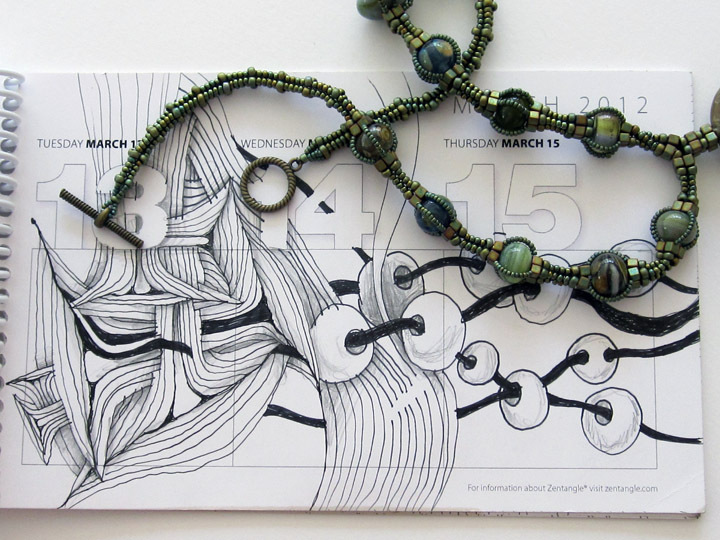 Thanks to both the bead village, and the Zentangle village! There is nothing more fun than cross pollination! This week's Diva challenge is centered on JJ LaBarbera's tangle, Huggy Bear. I thought it would be fun to fill every section of the string with the same tangle. 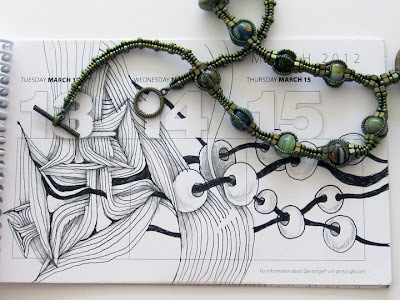 In true Zentangle® fashion, I had no idea what this would end up looking like. I don't ever feel confident starting out with a dotted grid, as I don't ever space them out very evenly. But that's all the more reason to love this art form... I never know what will happen! If I was able to space out the dots evenly, I most probably would be tempted to have more control over the whole thing. As it goes for me, the lack of control is usually way more fun! Once I had my basic circles going, other things began to happen, so I just followed the lead of my little voice of intuition. No thinking, just moving. No second guessing, just moving. No judgement, just moving. Always a metaphor for life itself. The fun really is in the process. The outcome might be pleasing, too, but if I had known where I was going before I got there, I would have lost a lot of the joy of the journey. Expectation can be a real buzzkill. I had a great time!!! Thanks, JJ and Laura!